ST. LOUIS (CNS) — Katie Hoormann stepped up to the plate with the bases loaded. She waved the bat around and got set. The young man who was the pitcher let an underhanded toss soar. Katie swung and made contact, driving in a run for the Little Sisters of the Poor residents’ team. Applause erupted in the open-space auditorium. “She’s 96 years old,” exclaimed a gentleman sitting in a chair, with his walker at his side. The Little Sisters of the Poor St. Louis Residence is a special place, with the sisters available at any time to respond to residents’ needs. Lay staff members do much of the work at the senior apartments, independent living for those who desire minimal assistance, intermediate nursing care and a senior center for elderly residents of the neighborhood, but the sisters’ presence is unmistakable. A spiritual approach to aging is evident everywhere at the residence. The chapel is central to the building. There is a well-liked, full-time chaplain, Father James Beegan, a Missionary of the Holy Family. Mass is celebrated daily and other sacraments are available regularly. Residents and sisters can join for a daily rosary. Sister Michael Mugan, administrator of the St. Louis Residence, said as people grow older they have fewer distractions than when they were younger and were working and raising a family, so their faith means more to them. The apostolate finds Christ in the residents, the staff and anyone who participates in the life of the home. “It has to go beyond a level of just a social ministry or social experience. There’s more to life than that,” Sister Michael told the St. Louis Review, newspaper of the St. Louis Archdiocese. The aim is to bring others the “joy, joy, joy” that Pope Francis says is essential to a Christian life, Sister Joseph noted. In January, 10 members of the staff of Chaifetz Arena at St. Louis University, employees of the Global Spectrum management company, took a day to visit the home and play ball with the residents. Besides supplying players for the opposing team and escorts for the residents as they shuttled around the bases — Chaifetz lost badly, by the way — the visitors filled in with an organist and announcer. Sister Joseph started singing “Take Me Out to the Ballgame,” accompanied by the organist, and soon residents joined in the singing. Resident Julia Margraff was playing and cheering on her team. She recalled the fun residents had watching the World Series last fall and how much they enjoy other activities. Another resident, Nancy Chabloz, delighted in her teammates’ abilities and displayed her own prowess at the plate. Though she didn’t hit one past the fielders and on the stage as she had predicted, she did hit a nice line drive. Hoormann — who took Louisville Slugger as her nickname after her hometown — noted how much she enjoyed the exercise, adding that “there’s always something going on here,” including Mass twice a day. “This place is one step this side of heaven,” she said. St. Jeanne Jugan, the foundress of the Little Sisters of the Poor, gave a gift of family spirit to its members, said Sister Joseph. “Here, we don’t know the residents as room numbers,” she said. That family spirit extends to the employees, volunteers, benefactors and members of the Association Jeanne Jugan, a group of lay followers. When someone is dying the residents come in and pray with that individual and the sisters. Getting to know the residents has been a pleasure for the staff. They learned that one woman had been an official observer at the Second Vatican Council. “This poor lady had dementia. But she was someone dear,” Sister Joseph said. At the St. Louis Residence, no one is anonymous. Among the residents is a woman who was a church organist and teacher — Mary Lucas — and is still playing and giving pointers about music, “keeping us on our toes,” Sister Michael said. Another woman had once led Blessed Teresa of Kolkata around neighborhoods of north St. Louis. While the “fun, fun, fun” is a big part of the St. Louis Residence, so too are the simple acts of caring. As the sisters moved through the hallway, they stopped to assist a woman in a wheelchair and to help another woman drink a glass of water. Lois Coleman of St. Charles Borromeo Parish in St. Charles, Mo., began volunteering at the residence while in high school and now is provincial coordinator of the Association Jeanne Jugan. Coleman is a retired nurse and volunteers to provide wellness checks for residents of the apartments among other efforts. 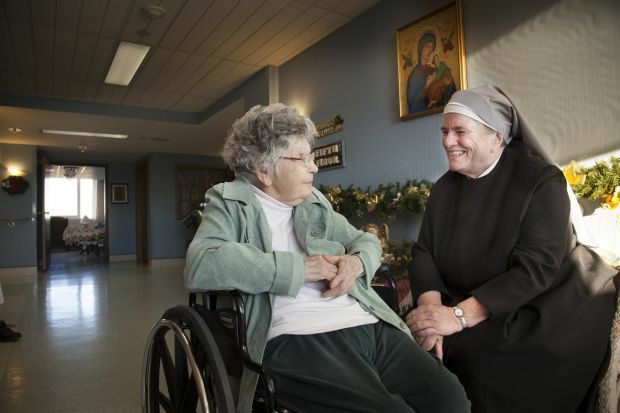 Collaborating with the Little Sisters of the Poor means serving Christ by serving the elderly poor and bringing a joyful spirit to the world, Coleman said. Kenny is a staff writer at the St. Louis Review, newspaper of the St. Louis Archdiocese.